You are here: Home » MEDIA » Books » Screening Space: The American Science Fiction Film by Vivian Sobchack (book review). 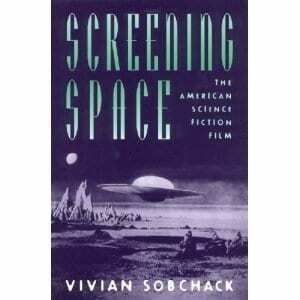 Screening Space: The American Science Fiction Film by Vivian Sobchack (book review). Written originally in 1980, this book, ‘Screening Space: The American Science Fiction Film’ by Vivian Sobchack, looks at classic American SF films and some modern ones in order to posit a theory of how Science Fiction is defined on film. It puts itself forward as the first real attempt to treat Science Fiction films as a serious genre for study. Hard to imagine but apparently people did not think they were worthy of examination or critique in the dark ages of the 1970s. ‘Screening Space’ also functions as a sort of history, albeit only concentrating on the time-line of American films. Although edited with an extra chapter, the bulk of the book remains the same as the earlier edition. Looking back to 1977, when ‘Star Wars’ was a flower in the desert of SF films, it is no surprise that the book finds it has to apply itself to much output that would already have been scornfully written off. This does not matter as what the author has tried to do is to draw out the defining elements of a film that is Science Fiction without critically judging and condemning certain examples. ‘Screening Space’ is split into sections that look at specific aspects of how an SF film is constructed, the similarities with other genres and those aspects that stand out. It does make you realise how much you take for granted in a film’s structure and how the sights and sounds lead us to making assumptions and judgments. I would say this book is essentially aimed at film students but there is plenty for those just interested in SF films and it might make you seek out some of the older films critiqued here. Chapter 1 attempts to identify the film itself, using it does so in a logical way I felt confident at the end of the chapter that it would help make sense of how such a film is put together. Its true there are probably more bad examples of SF films than good ones but the author argues the case that none set out to be bad. Once you have established how the SF film is constructed then you can deal with why it doesn’t always work. Chapter 2 examines the look and this has to be wide ranging as she acknowledges that an SF film has quite a variety of location and intention. To be ambitious enough to try to identify all its themes is quite something and although many of these scenarios are ones we might take for granted now, the author considers them in a historical and social context. Chapter 3 is on sound which includes music, sound effects and the script. Sobchack make a point that the script is often the part that falls short, relying on the wow factor of the special effects whilst resorting to cliché and melodrama. I have to admit when I got to chapter 4, which is new to this edition, on Post-Futurism I got completely lost. Struggling with the vocabulary and the meaning, I felt very much in a strange land. I think it is acknowledging that we are now living in the very future that we previously only tried to imagine. To put it bluntly, we are ‘back to the future’. Sobchack looks how we then adjust to our ‘future’ with its digital products and what SF can offer us. Even this chapter is itself ‘dated’, there are no iPods, immersive 3D or Wiis and, of course, we have come a long way in a short time. As the period she discusses also starts to re-make classic SF film, she considers how the emphasis on the ‘other’ changes in different times-how the alien became lovable (‘Close Encounters’, ‘ET’) and how the rebels become the heroes (‘Star Wars’) and nostalgia for the past becomes the future we aspire to (‘Back To The Future’). Indeed, I feel she has a much richer seam of films to draw on than ever before as post-Star Wars, there was a rush to both space and inner space. Discussing how our own sense of space has become fragmented by the use of digital technology, this actually sits quite well with lives lived on Facebook and Twitter. We are ourselves but not ourselves and the whole chapter deals with this onslaught on our sense and how SF films continue to try to make sense of it for us. The 1980s saw ‘Blade Runner’ (the director has tried to make sense of that ever since) and its non-humans who ‘lived’ more than the humans did. The current obsession other than with re-makes is another kind of do-over. If you look at ‘Source Code’, ‘Looper’ and even ‘The Adjustment Bureau’, there is a desire to get things right no matter how many times you have to try. It’s harder than ever to tie down a film into its genre. Is ‘Life of Pi’ Science Fiction? The film’s landscape is realistic but what we are seeing is a story which has certain levels of truth. I think the author could continue to update this book as we move down the timeline to our virtual lives. Although I found some of the vocabulary in the book challenging, I think it stretches the reader in a good way and encourages us to look beyond the surface. With the tools we can continue to enjoy SF films and I would include in this TV series offer new ways of looking at the world and new worlds to look at. Screening Space by Vivian Sobchack (book review). « Drama Showcase: My Mother Was An Alien – Is That Why I’m Gay? by Nigel Fairs (cd review).